Why Liverpool Should Go After This 24 Y/O Newcastle United Defensive Ace Using Divock Origi As Bait! Liverpool are looking like serious title contenders for the upcoming season as Jurgen Klopp has played his cards well in the transfer market. There were some gaping holes in some departments which the German manager has addressed. He didn’t shy away from breaking the transfer record for a goalkeeper as Liverpool brought in Alisson Becker from AS Roma. However, there are still some concerns over the backup options when it comes to the centre back position. Joel Matip was recently injured in a preseason game and he has gone back to Melwood from America to continue his recovery and rehabilitation. It is still not clear how long will he be out for but it seems likely that he will miss the start of the season. Dejan Lovren has joined the squad late given his exploits at the World Cup with Croatia and the Reds suddenly look thin in the defensive department with other viable options being Ragnar Klavan and Joe Gomez. Many fans are still wanting Liverpool to sign a centre-back and an attacking midfielder. However, Klopp recently gave an indication that his team’s transfer dealings are already done. This can be a make or break season for Klopp as he tries to end Liverpool’s trophy drought and he should be well prepared for the challenges of the upcoming season. Maybe Liverpool can turn to Newcastle United‘s Jamaal Lascelles who had an impressive season last time around as he won the Magpies’ player of the season award. At just 24, he is the captain of the team and the Englishman has drawn a lot of interest in the summer from various teams. However, Rafael Benitez has stood firm on his stance and is keen to hold on to his star defender. Meanwhile, Newcastle United are desperately searching for a striker in the transfer market as they struggled to score goals freely last season. 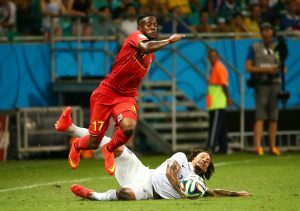 That is where the Reds can make an offer which the Toon will find tough to refuse as they can bring in their out of favour striker Divock Origi into play. It is expected that the Belgian will part ways with the club in the summer and an Origi plus cash deal for Lascelles could be tempting for Benitez as well. Signing a striker is of topmost priority for United, however, they are yet to land anybody. Bringing him will certainly make Liverpool more formidable at the back as they will have two leaders in Van Dijk and Lascelles in the heart of the defence. Both of them are in their mid-twenties and are at the peak of their powers. They still can play for quite a few years and the Merseyside club can have their defensive frailties sorted once and for all. Read More: Liverpool Could Miss Out On 25 Y/O Ligue 1 Star: Big Blow For Klopp’s Plans? Origi, on the other hand, can be a decent bet for the Tyneside outfit, however, Benitez will be aware that Lascelles in one of the most important players in his set up but Liverpool should definitely go ahead and make this offer which will put the ball in Benitez’s court as he will have a big decision to make about whether to sacrifice his defensive ace in search of a goalscorer. West Brom Join The Race To Sign In Demand Rangers Ace: Where Can He Fit Into Moore’s Team? Chelsea Looking To Snap Up 20 Y/O Bundesliga Winger: Is He Worth The Fuss For Sarri? Liverpool Wants Belgian Forward To Stay In England: A Good Call By Klopp? Is There Anyway Back For This Liverpool Forward After His Last-Gasp Winner Against Everton? Liverpool Striker On The Radar Of Bundesliga Club: Should The Reds Let Him Go?